The US Producer Price Index declined 0.5% month-over-month in September, much farther than the 0.2% drop expected by economists (statisticians, really). With retail sales providing little positive emphasis even among the large segment of commentary focused exclusively on the monthly variation rather than the intense consequence of wider context, the idea that the Fed will confirm the final stage of recovery by raising rates is all but extinguished. It has been an alarming slide, as expectations for a rate hike in the now-forgotten euphoria of 2014 were “sure” for March 2015. Now, standing upon global wreckage that can no longer be denied and derided as “trivial” or “impossible”, expectations are deliriously subdued having the FOMC put off the good news until March 2016 (at the earliest). U.S. wholesale prices fell a seasonally adjusted 0.5% in September. Economists surveyed by MarketWatch had predicted a seasonally adjusted 0.2% decrease in the producer-price index—an important inflation indicator—while September retail sales rose 0.1%, in line with estimates. Those lackluster readings suggested to some that Federal Reserve policy makers will continue to face stubbornly low inflation readings, fueled by a sustained drop in commodity prices. The U.S. central bank’s mandate centers on maximizing employment and keeping inflation at a 2% target level, which is considered a healthy level of price increases. Poor results pose a dilemma for investors because they imply that the Fed won’t be quick to raise interest rates soon—a fact that has helped drive up the value in so-called risk assets like stocks—but they also point to an economy that may not be firing on all cylinders. That view is relatedly perched by the same productive disdain emanating from China. 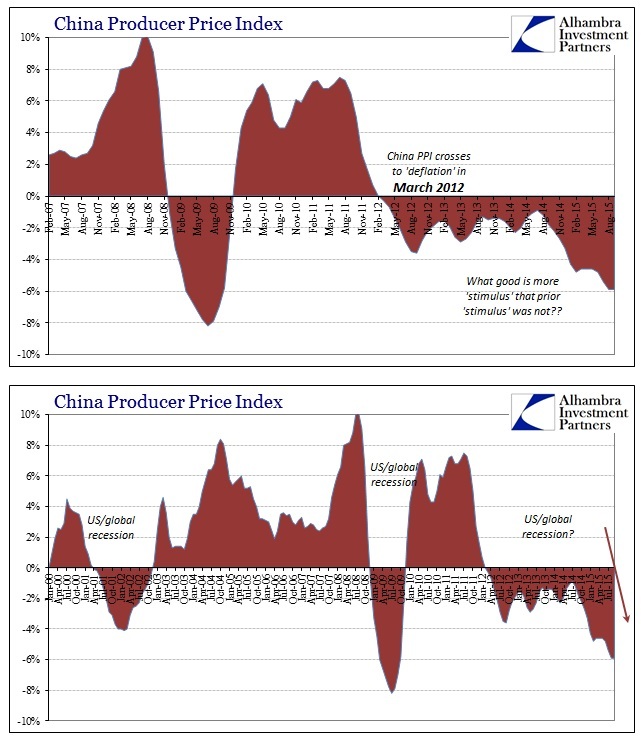 While economists and “experts” were expecting a slight improvement in China’s PPI, it came out at the same -5.9% as August. 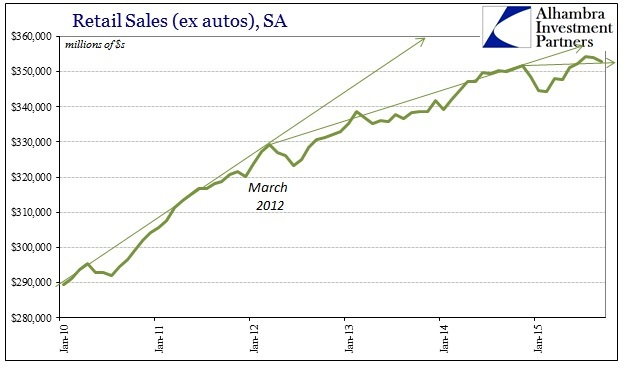 The correlation with not just the US PPI but retail sales has been ignored until recently. 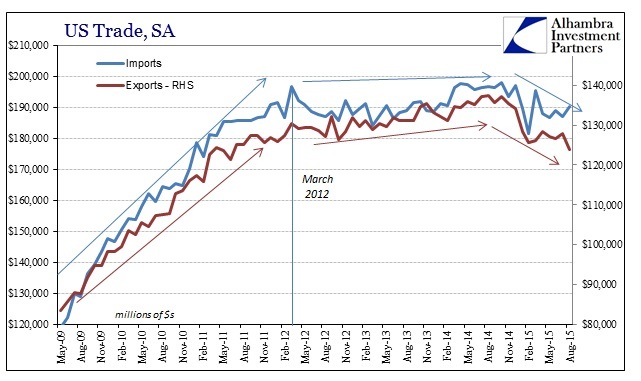 China’s oversupply and overcapacity is directly related to its ability to send goods overseas to especially the US; and the US, despite all the GDP euphoria here and there, has been quite amiss in perking up demand that was supposed to follow enormous monetary “stimulus” aimed at nothing more than “aggregate demand.” China’s reform agenda is really all you need to know about the state of the US economy. The Fed expanded its balance sheet by $4 trillion and China still crashes anyway; seemingly worlds apart but really the same eurodollar pathology that demands, no matter how belated, appreciation. That message is just now starting be accepted and factored even though the “dollar” turned well more than a year ago. Denial is a strong facet of orthodox thinking.